Simply lift up from the top to turn it on, the brightness depends on how much you reveal the COB LED element. 3x AA batteries needed. Rather than rechargeable laterns, it's more easily to be guaranteed of full power supply only by taking few replacing batteries. No glass is used in making this latern, durable and shock resisitant, designed for travel, fishing, outdoor activity, highway emergency, and etc. ✔VERSATILE USE: Suits for both outdoor and indoor use, with two handle to be easily hung up as camping latern or used as light in the tent. And you can also use it simply as a table lamp, supplied by 3x AA batteries(not included) with out cord, convenient to take it anywhere. ✔ULTRA BRIGHTNESS: Compared with the old version latern of 26 LED, this new design comes with 300LM COB LED and trio high ratio reflection mirrors, 2 times brighter. Only one of it is enough for a team to light up the campsite. ✔COMPACT & LIGHTWEIGHT: This is a cup-sized latern that saves your backpack space for other necessary equipments, and also lightweight, designed for proffesional camping. BUY ONE for your team to provide a harmonious and romantic air of playing game and chat. Have fun with it! 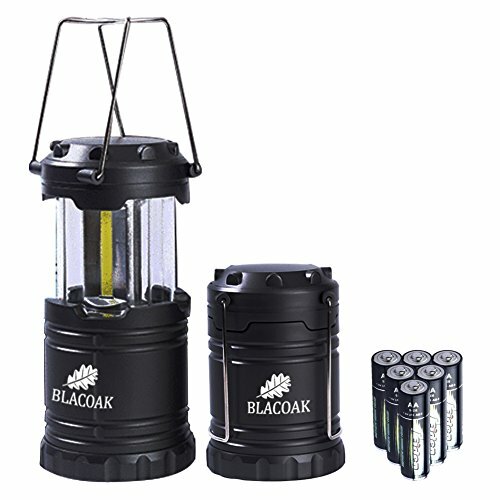 ✔WATERPROOF: Blacoak Camping Latern is also water resistant for preparation of mist or rainy weather. Rest at ease with it in you campsite, this latern is designed to guard you team from darkness in any weather. ✔PURCHASE WITH GUARANTEE: Every BLACOAK Camping Latern are assured with high quality and superior after service. We see highly of our products and customer service and promise ONE-YEAR-WARRANTY for every product purchased from BLACOAK. We suggest customers contact us firstly instead of Amazon customer service and promise to provide method of 100% satisfiction to solve every of your problem! If you have any questions about this product by Blacoak, contact us by completing and submitting the form below. If you are looking for a specif part number, please include it with your message.